to join 11 local artists in a period of intensive research, production, and public engagement. The artists represent a generation of practitioners working seamlessly across disciplines and borders, displacing aesthetics and redefining best practices against a backdrop of constant change. Each artist was commissioned to engage in a major new work during their time in the city, and the exhibition serves to articulate these approaches through the locus of Istanbul, a city echoing this artistic flux, and whose questions and promises embody a microcosm of compatible concerns. The exhibition was held across 3 floors of the Sishane Otopark, inhabiting five central halls, a metro level mezzanine, and the public outdoor park. The exhibition spans over 80,000 square feet and features newly commissioned presentations by 41 artists and collectives. The Moving Museum Istanbul was supported by Founding Partner The Vinyl Factory in London. With a cultural agenda spanning art, music, architecture and fashion philanthropy, The Vinyl Factory was an integral partner in supporting the vision of The Moving Museum. 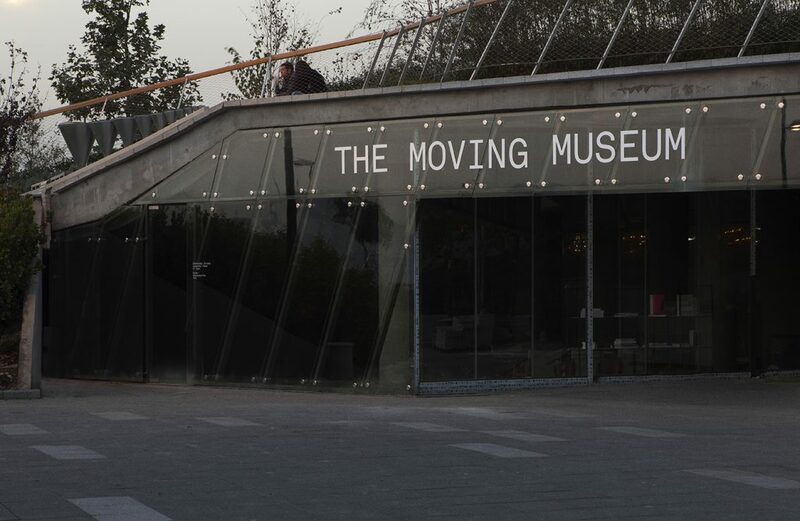 The Moving Museum brought together several Governmental and Private Cultural Partners who were instrumental in realizing The Moving Museum Istanbul through their support of individual artists. These included, The Mondriaan Foundation, The Australian Embassy, Pro Helvetia Switzerland, OCA Norway, The Danish Arts Council, The British Council Istanbul, The British Council UK and The Arts Council England, The French Institute, The Consulate General of Sweden, The Ontario Arts Council, Canada Council, The Swiss Festival and The Public Affairs Embassy of the United States of America. All new artists projects were commissioned for The Moving Museum Istanbul, with 38 individual projects initiated and realized over a 6 month period. Artists collaborated with local practitioners, researchers, fabricators and craftsmen across all disciplines in Istanbul, and throughout Turkey. The result was several major new bodies of work across all mediums including films, photography series’s, large scale installations, sculptures and paintings. The public program served as the backbone to the residency as an active interface, a more organic, less institutional meeting ground for interested public. Over 15 public events were hosted across the spaces with 40-60 attendees per public program event. Programme comprised of talks, performances and off-site exhibitions. The Moving Museum mobilized a comprehensive Digital Programme that gave audiences around the world the opportunity to engage and participate with the Istanbul Residency. 14 video interviews with artists were produced over the residency period. 8 recorded videos of public events were documented and shared with international audiences.